“The daily life of the Cathedral is the responsibility of the Dean”, explains the Lichfield Cathedral website. 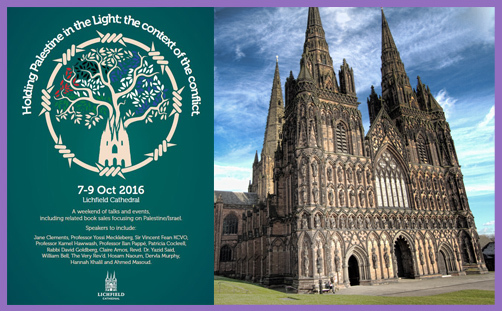 And the Dean of Lichfield Cathedral is the Very Rev’d Adrian Dorber, who decided to organise a whole weekend conference dedicated to the Israel/Palestine conflict. Quite why he chose that strife over (say) those of India and Pakistan or of Saudia Arabia and Yemen (or even Iran and Syria) is unknown. But cathedral deans are powerful people: if they want a conference to debate their particular theological bent or political grievance, they are free to organise one and invite whichever speakers they choose to present their preferred slant (as we’ve seen in Manchester Cathedral). The Dean of Lichfield Cathedral clearly has a lot of time for Palestine and boundless sympathy for Palestinians, and not much time or sympathy at all for Israel and Jews. ..I had little doubt I was walking into a hate-festival. One of the ‘secrets’ of such an event is that the range of speakers is always skewed. People such as Ilan Pappe see sharing a stage with Zionists as ‘normalisation’. Jewish self determination, the right of a ‘Jewish home’, these are positions too ‘dirty’ for anti-Israel activists to accommodate. Therefore if Pappe is present, you know their views have been ideologically protected by the structure of the event itself. The building has been cleansed of all support for the Jewish national movement. ..I made my way to the café and had to walk passed another exhibition. On display was pro boycott material. I saw more leaflets on display. I picked up a magazine from the group ‘Friends of Al Aqsa’. This is a group that has recently had its bank account closed because of possible funding of “illegal or other proscribed activities”. This set the theme of the weekend. Every single stall, every part of the exhibit, was designed or delivered by activists supporting the boycott. There was a book stall. Every single book was one that castigates Israel and Zionism. Not a single opposition voice was on display.. ..In the simple comment that ‘Jesus was a Palestinian’, is an absolute denial of Jewish history… There were even attempts to rewrite attendees at very early Christian events as being ‘Arab’ rather than Jewish. ..A group called ‘Lichfield Concern for Palestine’. All talk was about Israeli brutality. No mention of Arab violence anywhere. ..Next up was Professor Kamel Hawwash, Vice-Chair of the Palestine Solidarity Campaign… There will be no starting point for peace until Israelis get down on their knees and beg for forgiveness. Total submission… This is the vision of ‘peace’ that the church invited to talk. ..I have seen Ilan Pappe now more times than I can count. He is charismatic antisemitism personified. Pappe wastes no time. ‘There is no such thing as modern antisemitism’. ‘Because you spoke earlier’ came the reply. As an answer it did not suffice. Several people had asked more than one question. The situation was absurd. There were no more questions. Only Mandy’s hand remained aloft. There were still 10 minutes left till the end of this session. All of this comes just a fortnight after the Archbishop of Canterbury declared: “Antisemitism is an insidious evil.” And he made it absolutely clear that “the virus continues to seek a host. It latches onto a variety of different issues: financial inequality, wars and depressions, education, politics and government, grave international issues, such as the rights of Israelis and Palestinians..” And conferences organised by zealous deans in our national cathedrals? The allegation against the Dean of Lichfield is not that he is an anti-Semite, but that he naively sought to have the ‘Palestine’ issue debated in his cathedral without ensuring balanced advocacy and an impartial chairman, and thereby desecrated Lichfield Cathedral with the whiff of anti-Semitism, anti-Zionist conspiracy theory and the delegitimisation of Israel. To me there seems no question that denying the right of Israel to exist, failing to take seriously the claim of its citizens to security and recognition, viewing the complex situation in the Holy Land as an unparalleled example of injustice when it is fact surrounded by egregious instances of oppression and unsettlement, adopting a one-sided view which fails to recognise the legitimate interests and real anxieties of all sides – all these can be manifestations of, or excuses for, real antisemitism. So why would he allow his cathedral to host an exhibition and conference which not only denies Israel’s right to exist, but denies the very phenomenon of modern anti-Semitism? Antisemitism.. permeates and pervades all that it touches when it is swept under the carpet, denied and not confronted head-on. The challenge for us is to be united in facing the uncomfortable truths of our history and for faith groups to take a lead in being transparent and honest in exposing the hidden recesses of prejudice. I want to reaffirm my welcome and support for the Archbishop of Canterbury’s recent condemnation of the ‘virus’ of antisemitism. I attended part of the conference at Lichfield Cathedral, as a guest, as a mark of my commitment to ongoing dialogue and building better relationships. The CCJ will continue to engage in dialogue with the cathedral to build a relationship of deeper understanding that I hope will bear great fruit in the future. Cathedral naves are the traditional meeting places for people to come together and debate matters of concern, to learn, reflect and find wisdom in the middle of difficulty and confusion. Our recent weekend conference ‘Holding Palestine in the Light – the context of the conflict’ was an attempt to help people understand the complexity of the situation and what roads to peace are available for all the people of the Holy Land, Israelis and Palestinians. There were some passionate exchanges and contributions from the floor representing very diverse views. It takes courage to make peace and the first step is to listen. That is a proper requirement for everyone who is concerned with the long term future and flourishing of all the Israeli and Palestinian people. We hope that the opinion, prayers and righteous action of people of faith and goodwill could yet help bring all sides together on a path to a lasting peace. It is my hope, and that of the Ecumenical Planning group who arranged the conference, that the weekend was a small contribution to understanding, and an encouragement to people of faith to pray and work for peace. Clean sweep: dustpan and brush not required.